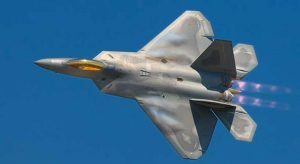 Boca Raton, FL – The 2019 Fort Lauderdale Air Show will feature the U.S. Air Force’s F-22 Raptor Demo Team when it returns to Fort Lauderdale Beach, May 4-5. Based at Langley AFB in Virginia, the F-22 Raptor Demo Team joins the U.S. Navy Blue Angels as a double headliner for the event. Show attendees will see a full capabilities demonstration by the Raptor, which offers a combination of stealth, super cruise, maneuverability and integrated avionics, coupled with improved supportability. Performing both air-to-air and air-to-ground missions, it can’t be matched by any known or projected fighter aircraft. A combination of sensor capability, integrated avionics, situational awareness and weapons provides air superiority against any threat. The F-22 possesses a sophisticated sensor suite allowing the pilot to track, identify, shoot and eliminate air-to-air threats before being detected. Advances in cockpit design and sensor fusion improve the pilot’s situational awareness. The F-22 has a significant capability to attack surface targets. Munitions are stored internally and use on-board avionics for navigation and delivery. Low-observable technologies (known as stealth) provide significantly improved survivability and lethality against any threat. Tickets are on sale now at special intro pricing through December 10th, a savings of 40 percent off the day-of-event price. For more information on the F-22 Raptor and the event please visit http://fortlauderdaleairshow.com/ or follow the event on Facebook.